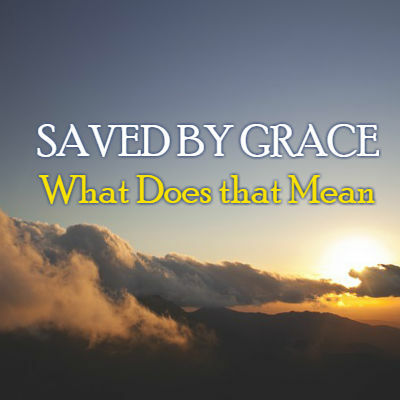 Saved by Grace – What does that Mean? Today I would like to talk about another word we Christians throw around a lot and at many times, we don’t quite understand its meaning. It is the word “grace.” We hear things like you are saved by grace and there’s nothing you could have done. Salvation is a gift, that you don’t deserve it. Just as we spent time last week looking at God’s love and what we mean when we say it’s unconditional, today I want us to spend some time looking at God’s grace. What is it? What do we mean when we say we are saved by grace? Grace is God’s unmerited favor (kindness) toward mankind. Grace is getting something you don’t deserve. In other words, we didn’t deserve God’s favor or his kindness. Why is this the case? – You were dead in your transgressions and sins in which you used to live. Paul wrote to followers of Jesus to whom he explained the concept of grace. – You walked according to the ways of this world; followed the ruler of the kingdom of the air. The spirit who is at work in those who don’t obey God. – All of us (Paul included himself) followed the passions of the flesh, carrying out the desires of the body and the mind. We were by nature children of wrath, like the rest of mankind. Rom.3:23 For all have sinned and fall short of the glory of God. We deserved God’s wrath because we were alienated from God because of our sin. (We were dead in our transgressions and sins in which we used to walk). We are objects of wrath when we live according to prince of the air, the spirit at work in those who are disobedient. We are subjects of wrath when we live according to the sinful nature; when we let loose the passions of our body and mind. This is the way we all used to live until we discovered something God did. V.4) But God being rich in mercy, because of the great love with which he loved us. Even when we were dead in our trespasses, made us alive together in Christ. God showed us love even when were still sinners, Christ died for us. Even when we were dead in our sins, God made us alive in Christ. By Grace you have been saved. God showing us love despite our condition is an act of grace. He gave us his kindness right when we didn’t deserve it. Instead of giving us wrath and judgment God gave us love by giving us Jesus. God made us alive in Christ (v.5) Grace has a name, Jesus Christ. When someone believes in Jesus, that person makes a transition from dead into life and from darkness into life. God gave us life in Jesus, his unmerited kindness. God raised us up with Christ and seated us with him in the heavenly places. (6) Because of Christ, we will be raised up and will be seated with him in the heavenly places. We are heaven bound in Christ. Those who are in Christ will be raised up and seated with him on his throne. (v.7) In the coming ages God will continue to show the immeasurable riches of his grace in his kindness (goodness) toward us. When we know what God has done, we realize how good he has been to us. When you look at the cross, remember how good God has been to you. Grace is God’s gift to the world, you cannot work for it, all you can do is receive it. This is where faith comes in. You are saved by grace through faith. Faith is the means by which you benefit from God’s grace. Rom.5:2 Paul said that through faith in our Lord Jesus we gain access to the grace in which we now stand. In other words, if you don’t believe in Jesus, in what he has done for the world, then you are taking God’s grace for granted. Paul wrote to the Galatians (Gal.5:4) who were falling away from grace. They were trying to earn a right standing with God in their practice of rituals or the observance of certain laws. Paul wrote to remind them that you cannot be justified by doing things, but only by faith in Jesus. You are saved by grace through faith. Faith is necessary for you to be saved by God’s marvelous grace. Grace doesn’t just save us, it trains us to live for God. It trains us to renounce ungodliness and worldly passions. God’s grace doesn’t just save us, it teaches us to live for God in our days. It teaches us what it means to stand in grace and not take it for granted. Before we found Jesus, we were dead in our transgressions and sins in which we walked following our sinful desires, we deserved God’s judgment. But God who is rich in mercy because of his great love with which he loved us made us alive in Christ. By grace you have been saved through faith. This has been God’s gift for you. When we truly understand God’s grace, then we also understand what we must not take this gift for granted. If you have not embraced God’s grace, you can do it today by trusting Jesus as Lord and Savior. If you have already received God’s grace, then continue to stand and walk in grace. A grace that trains you to renounce things that are not from God; grace that teaches us to live self-controlled and upright lives as we wait for Jesus. Thank God for his amazing grace.